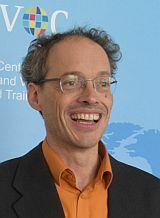 Max Ehlers joined UNESCO-UNEVOC in 2002. All along, he has been responsible for all issues regarding information and communication technologies (ICT). He is the mastermind behind the development of UNEVOC website and online services. Max is the focal point for issues related to the use of ICT and digital media in and for TVET. Since 2016, he is also one of the Regional Focal Points for the UNEVOC Network in the African region. Before joining UNESCO-UNEVOC, Max worked as an IT specialist for various companies. A native of Germany, he holds a postgraduate degree in political science.